I’m at least a day late getting your September auction list up, so the first listing below won’t be of much use to anyone. But there are over two dozen other events listed for the rest of the month, in Michigan, Ohio, Pennsylvania, Minnesota, Indiana, Iowa, Oklahoma, and Missouri. These include benefit sales, school auctions, and some individual family auctions. As usual, a couple of non-auction events are thrown in. Special thanks to our auction compiler for her hard work on this fifth consecutive month, and to Jerry for the photos, taken last month at the Ickesburg (Perry County), PA Charity Auction. As always, please add anything we’ve missed in the comments section. Sept. 1, 2014, Mon. (Labor Day) – Quilt, Craft, & New Furniture Auction & Flowers & Produce 8:30 am, Cashton, WI (The Fall Consignment Auction is Oct. 22). 2347 Dell Road, Cashton, Wisconsin. Sept. 5 & 6, Fri. & Sat. – Yutzy’s Semi-Annual Consignment Auction, 4431 North Chester Road, Charlotte, MI. Sept. 6, Sat. – Hazleton Semi-Annual School Consignment Benefit Auction, 1500 120th St. (corner of W13 & C57), Hazleton, Iowa. 319-269-2666. At Wapsie Valley Produce Auction (C57 = 120th St.; W13 = Amish Boulevard = Fairbank-Amish Blvd.). Twice-yearly consignment auction for the school in the spring and fall. Sept. 6, Sat. – 8:30 a.m., 38th Annual School Auction for Barrs Mill School Harvest Sale, 8892 Barrs Mills Rd., Sugarcreek, OH 44681. Sept. 6, Sat. – Gonvick Annual Fall Amish Quilt & Consignment Auction, Clearbrook, Minnesota. Sept. 6, Sat. 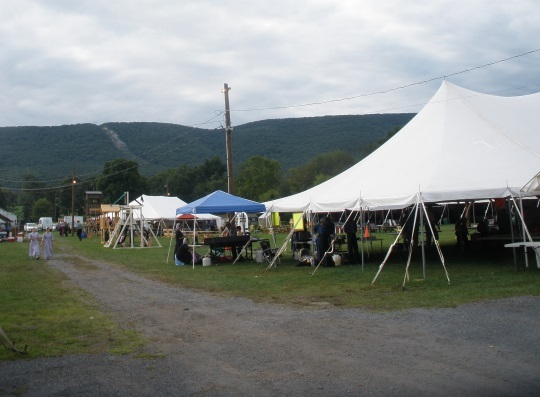 – Beaver Run Amish School Consignment Benefit Auction, 290 PPL Road, Danville, PA.
Sept. 6, Sat. – Public Estate/Benefit Auction, 344 Jonestown Rd. Thompsontown, PA 17094, Hostetler property. Amish lunch and bake food stand. Sept 10, Wed. – 10 AM. Gingerich Moving Sale, threshing machines, farm equipment, tools, miscellaneous items. Rudy Gingerich family auction. 1340 Fairbank Amish Blvd., Hazleton, IA. 319-352-2804. Sept. 12, Fri. – 5:00 p.m., Weldy School Benefit Auction, 1½ miles west of Nappanee, Ind. at the Wilson Yoder residence at 29607 CR 52. Sept. 13, Sat. – Yoder’s Consignment Auction, Shipshewana, IN 8:30 AM. Yoder Family Farm, 2270 S 1000 W Shipshewana, IN. Sept. 13, Sat. – Annual Clarita Amish School Consignment Auction, Clarita, Oklahoma. The second Saturday of September each year an auction is held on a farm near Clarita to raise funds for the local Amish School.Raymond Miller Home, Rt 5 Box 415, Clarita, OK 74535. Sept. 13, Sat. – Morton Clinic for Special Children Benefit Auction, Blair County, PA, at Morrison’s Cove Produce Auction. Sept. 20, Sat. – Black Buggy Day, Chouteau, Oklahoma. Sept. 20, Sat. – Holmes County Home Benefit Auction, Holmes County Home, 7260 State Route 83, Holmesville, Ohio. 330-279-2801. An annual benefit auction with the proceeds benefiting the elderly of the Holmes County Home. The auction is on the 3rd Saturday of September. Sept. 20, Sat. 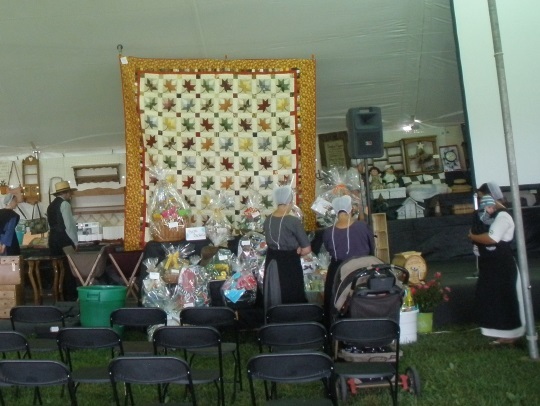 – 31st Semi-annual Honeyville Consignment Quilt Auction, at Borntreger farm, Millersburg, IN. In the fall on the 3rd Saturday in September. Sept. 20, Sat. – Gasthof Village Fall Fest and Annual Amish Country Quilt Auction, Daviess County, Montgomery, IN. What locations are these two pictures from? I am just guessing you had a busy Labo(u)r day yesterday and chose not to post. I’m still curious about the locations of the pictures, but I scanned so quickly through the article that I missed the little picture that has a location description. They’re all from the Ickesburg (Perry County), PA Charity Auction. They are from Perry County, Pa but taken on the Friday night before the auction. The Friday night people are mostly Amish who are busy setting up for the event the next day. I find that the food is slightly better the day before with greater variety. Around here it’s almost always rib night and the next day is often chicken only. Let’s just keep that our little secret! I continue to appreciate this monthly listing. Sat. Sept. 6 beginning at 9 a.m. Benefit for Amish school. Logan County Consignment Auction Saturday Sept. 23 beginning at 9 a.m. 265 Goodman Road, Lewisburg, Ky. Sat. Sept. 13 not Sept. 23. Thanks for the listing, it will help us get to one of the sales. Are there any closer to us in IL or MO? The Strasburg Fire Company is having a Fall Quilt and Crafts Sale on 4 October 2014, starting at 8:30AM at the firehouse, 203 Franklin St. in Strasburg PA.
Not strictly an Amish event, but many of the fire company members and strongest supporters are Amish. Their quilts and crafts will be many. Hello, I will be in Minnesota the last week in Minnesota, and traveling to the National Park up north. Are there any Amish communities or events I could go visit? Thank you. I should have said, the last week in Sept. There are several Amish communities in Todd County, MN. The are also Amish in the SE part of the state. The other communities tend towards being small enough that you might not be able to find them easily while traveling without knowing exactly where to go. Erik has a MN entry in the Amish State Guide. The link is at the top of this page. Amish Tours are available in Lanesboro and Harmony, MN, if that interests you. Would you want to attend a produce or flower auction? If produce is still in season, Country Fresh Produce Auction is in St. Charles, MN. Many thanks, again, to “our” auction compiler. Even if we can’t make it to these events now, we can keep the names of the auctions and areas where they’re held for future use. For instance, Cashton, Wisconsin sounds promising (to me, from IL) for a day trip in the future…if only for the scenery! I know it’s not officially Fall yet, but I’d like to wish everyone here an enjoyable and productive Autumn season this year. I’m just wondering, Are Amish auctions & fundraisers more common in Fall, after harvest, or in Spring…since it seems a lot of hand crafted items are made during the cold, dark winter months? Just curious!! “Prepared and served by about 200 Amish volunteers, the food at the Hospice auction has become an event in itself. It netted $40,000 for Hospice in 2013. Five traditions of this auction are selling and reselling a sheet cake, (one cake was sold 10 times this year), offering vehicles and an Amish buggy, food such as the bacon, egg and cheese pretzel log, sports memorabilia, and quilts. (“30 years in, Lancaster’s Hospice Labor Day Auction is thriving”) with 5 photos. Sept. 13, Sat. – 9:30 a.m., Miller Public Auction, 25318 E. Elias Rd., Harwood, MO. The Beachy Amish Mennonites of Montezuma, Georgia, have their annual school benefit auction on Saturday, September 27, 2014. They wear head coverings, but drive cars, not buggies. The locals refer to grocery carts as buggies! Waterloo Cedar Falls Courier has an article, “Amish collector sells vintage machines to highest bidders,” along with 17 photos from the Gingerich auction in Hazleton, Iowa. “In getting started Wednesday, auctioneer John Marg noted the day represented something unique for him, too. The highest priced quilt at the Clarita, OK, Sept. 13 auction was $3,800 in the Moon Glow pattern, according to a friend’s report. Quilts at the Sept. 13 Seymour, Iowa auction sold cheaply. The top quilt was $400. A blog has Amish quilt auction pictures, I think from Minnesota, maybe Aug. 30 Wadena, but I would guess it to be Sept. 6 Gonvick. Sat., Sept. 20, 2014 at 2 p.m. The proceeds benefit needy people in the area. September 20, 2014, Sat., 11 a.m.
J. Yoder, Friends, Guests, & Neighbors, corner of Epworth Road and Pine Valley Road, Lewis County, Tollesboro, KY. Relocating auction, and consignments from friends. Food will be served to support the Oak Ridge Amish School. The Annual Alpine Schools Auction was held on Sept. 12 & 13 in Wilmot, Ohio. You can see some of the items for sale in the Photo Gallery of the auction listing. Many thanks for the list of all the Auctions in September. We are from England and travelling through Amish country in October. If anybody knows of any sales and events in Amish country in October I’d be so grateful. We’d especially like to find a horse or buggy sale. I’m going to be in Ky, OH and Lancaster PA. Check back tomorrow, will have the October list posted. And happy and safe travels. At the Sept. 20 auction for the Clinic for Special Children, a Memory Tree was sold for $35,000. An Amish man spent 3,000 hours making it, which would come out to $11.67 per hour, plus his materials. It’s an iron sculpture of a Japanese maple tree. A duplicate of the tree will be created and donated to the Clinic for the new garden area. 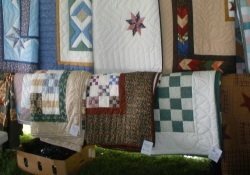 Some quilts and wall hangings were sold by online bidding. “Just a few unbelievable statistics from our Lancaster County benefit auction! “The Michiana Relief Sale board also announced that next year they will accept machine-made quilts into the auction for the first time. There seems to have been some confusion on the date for the Gordonville Fall Mud Sale & Auction in Pennsylvania, Sept. 20 or 27. I hope it’s okay to quote some dialogue. Thanks for the follow-up Linda, I guess this will be good to note for next year.